There is perhaps nothing I enjoy more than a warm bowl of soup on a cold, windy day (or any day for that matter). One of our favourite soups is any variation that includes butternut squash. While I adore eating butternut squash, I don’t so much adore cutting or peeling an uncooked squash. I’ve had more than a few “near misses” attempting to cut in to a squash, so you can imagine my delight when I discovered the old “toss the whole squash into a slow cooker, put the lid on and walk away for 5 hours if it’s on high or 8 hours if it’s on low” trick. Trust me; this may be the single greatest culinary tip of the year! 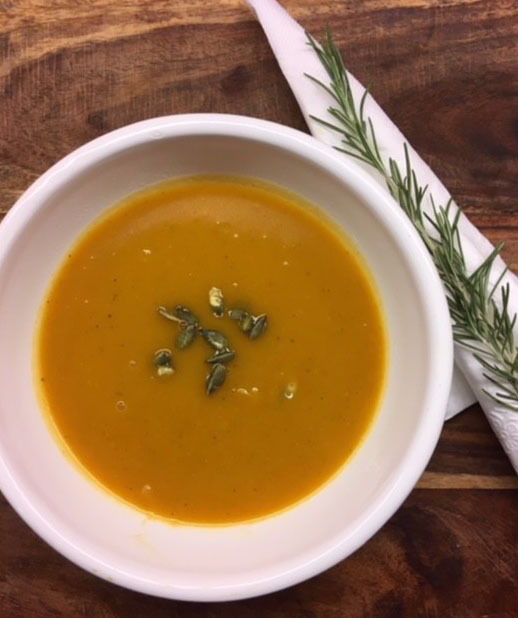 The first time I made this soup, I put the butternut squash (whole) in to the slow cooker in the morning, and when I came home in the evening proceeded to scoop out the seeds, then the flesh, and then made the soup. The second time I tossed the squash in overnight, then made the soup in the morning so that it could lightly simmer all the day, and the flavours could really intensify. Both techniques worked brilliantly so go with what makes most sense to you. The soup doesn’t have a lot of ingredients, which simplifies things. And I have to say, it’s the spectacular curry spice mix that really knocks this soup out of the park. We recently brought in various spices from Ganesha Foods in addition to spices from Kurndu. These spices are organic, non GMO, and simply fantastic! Saute onion in coconut oil. Add curry spice. Add scooped out butternut squash flesh. Add broth. Bring to a boil. Simmer for 20 – 30 minutes (or longer). Prior to serving, add coconut milk and blend with an immersion blender. Enjoy!